I have so many fun things to share with you from BlogHer Food, so instead of one monster post, I’m going to divide it up into a few. 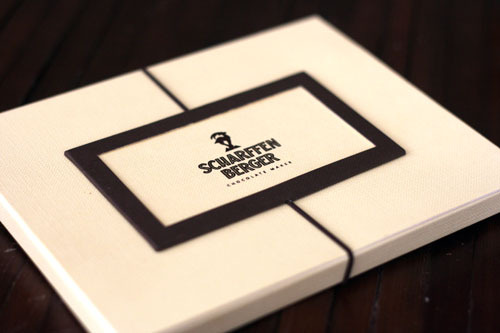 And since chocolate is hands down the best food ever, we’re going to start with Scharffen Berger. Ah, Scharffen Berger. They were an official sponsor of BlogHer Food and one of the sponsors at the fun after-party put on by Ree, Jaden and Elise. Which means I received a LOT of Scharffen Berger chocolate this weekend. Which means I’m one happy girl. My favorite? The 41% milk chocolate. To die for. It is creamy and smooth, but still has very rich flavor. But I still have lots of other chocolate to eat…tonight I’m going to make lava cakes and use the bittersweet chocolate and cocoa. You can bet I will report back on the results. Chef Elizabeth Falkner was at the conference with Scharffen Berger, who is currently hosting a recipe contest that uses ‘adventure’ ingredients combined with chocolate (you could win $10,000 – check it out!). In honor of the adventure ingredients, she made a magic chocolate box, which was essentially a giant chocolate box filled with all kinds of ingredients…both crazy and normal. If you wanted to eat it, you had to put on a glove and stick your hand right in. Linda from One Scoop at a Time captured an oh-so-lovely shot of me enjoying this unusual dessert. Elizabeth Falkner was also at the after-party, where she had prepared some amazing petits gÃ¢teaux. And yes, I ate my very own without any help. And yes, I was a little sick to my stomach afterwards. And yes, it was worth every bite. I got a chance to chat with Elizabeth for a minute, at which point I drilled her about Iron Chef…and here’s what I discovered, for those of you who care. The Iron Chef and the challenger get a short list of potential secret ingredients about one month prior to the taping, but they don’t find out the ingredient until you see it on TV. They are given a small budget to bring ingredients of their own, and there is a well-stocked pantry on set. I asked her if it was stressful or fun…and she said both! Maybe I’m just a geek, but I’ve always been curious about those little points. Elizabeth was very nice (and cool) and it was fun getting a chance to meet her! i’ve always wondered when they find out about the secret ingredient on iron chef. i’ve lost nights of sleep on it. i knew they had to have at least an idea. i always figured they were just told like beforehand so they could prepare awesome dishes. thanks jane, i’ll sleep well tonight. and i love scharffen berger chocolate. i prefer the darker stuff though. it’s nice to know I wasn’t the only one who thought about these cosmic iron chef questions. I skipped the chocolate box, I would have ended up wearing instead of eating it! It was great to see you and hope you enjoyed the rest of the weekend! I had chocolate for breakfast. I’m not embarassed to admit that. Sounds pretty much like the best birthday ever, Janers. I’m sure it was hard to enjoy yourself with the fam at home…. HA!! You deserve it, girl. Love ya. It was so great meeting you at the show! I didn’t get the 41% home… I ate it in my hotel room ;). Right now I’m making sea salt brownies with the unsweetened one. And I didn’t know it was your birthday! HAPPY BIRTHDAY! I too had wondered about the Iron Chef rules. 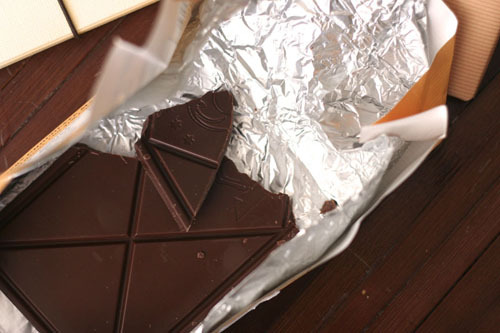 Just tried the dark chocolate a while ago – so good. Love dark chocolate. Okay. I don’t think I’ll ever get over the fact that I did NOT attend BlogHer Food. But hey, there’s always next year (and maybe it will be two days vs. one). I just hope I bring home as much chocolate as you did. It’s definitely on my top-10 list of favorite foods.